Eight years of apparently peaceful lion cohabitation ended in horror on Monday morning when Indianapolis zookeepers witnessed lioness Zuri murder the father of her cubs Nyack in cold blood. Our Zoo family is sad to announce that 10-yr-old male African lion Nyack has died. 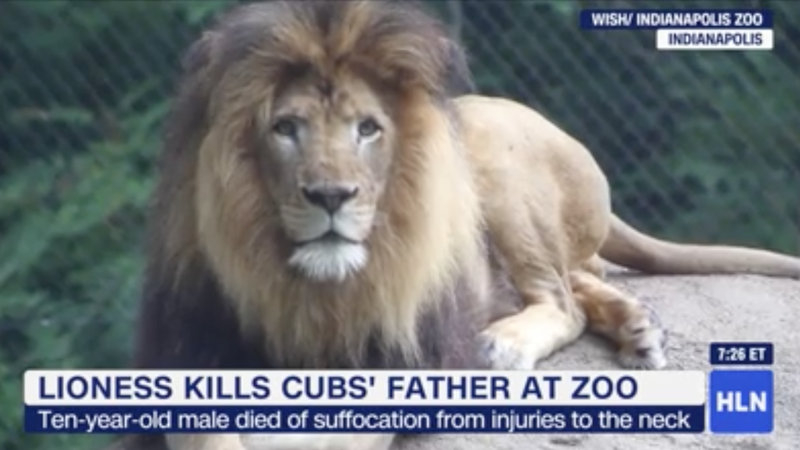 Earlier this week he was injured during a physical incident with female lion Zuri. We will conduct a thorough review to attempt to understand what may have led to this. Zuri and the other three lions are all ok. Zuri and Nyack had three cubs together three years ago. Nyack was a magnificent lion and he will be greatly missed. We appreciate the support from our community as we cope with the loss. So far the evidence is mystifying. According to the zoo, Nyack was “very vocal and laid back”; Zuri, an “attentive and protective mother.” He was a Sagittarius; she’s a Leo. He was a boy lion; she’s a girl lion. So far, a perfect match. Nyack was clearly beloved by many humans who’ve issued R.I.P.s on the zoo’s Facebook page. Maybe Zuri, on the other hand, was tired of conforming to another species’s social norms and projecting a heteronormative model of a nuclear unit. I would not rule out a shredded copy of the SCUM Manifesto amongst the leaves. Or perhaps it was a lion-centric issue. Zuri is said to have been standing between Nyack and their daughter at the time of the dispute. Nyack is survived by cubs Enzi, Mashaka and Sukari.